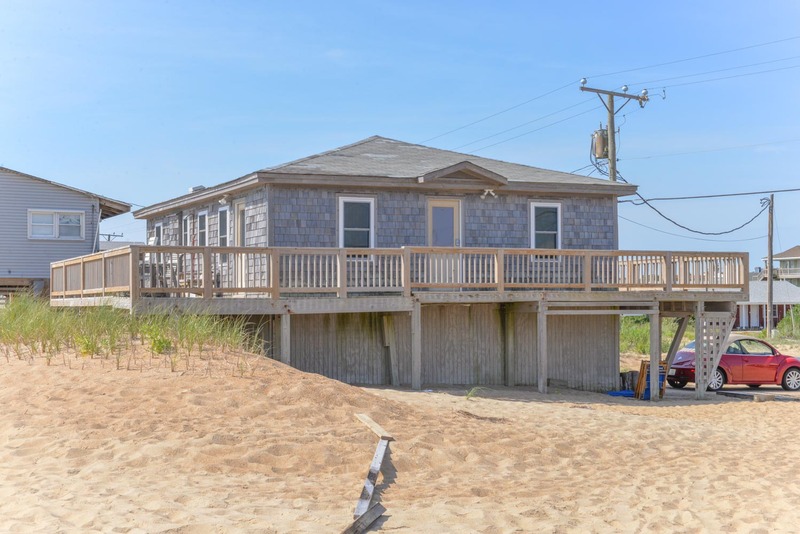 Outstanding Ocean & Beach views await when you vacation at this traditional beach cottage located in Kitty Hawk. Many improvements have been made recently including new decks, refinished hardwood floors, & updated furnishings. This home is pet friendly & allows 2 mature dogs w/ pet fees. This home is ideal for those that want an exceptional beachfront location. Relax & watch the waves roll in! Ground Level: Parking for 2 Cars, Garage, Laundry Area, & Outside Shower w/Foot Wash.
Main Level: Living//Dining/Kitchen Area, TV, Half Bath, 3 Bedrooms (1 w/Queen & Half Bath, 1 w/Queen, & 1 w/2 Singles), Full Hall Bath (Shower Only), & Wrap Around Sun Deck w/Outstanding Ocean & Beach Views. Features include: C/AC & Heat, Washer/Dryer, Microwave, 2 TVs, Wireless Internet, Wrap Around Sun Deck, & Deck Furniture. Two Mature Dogs Allowed w/Fees. This is a Non-Smoking Unit. The location of the home was perfect. It was close to everything that we like to enjoy while on vacation. The views and the deck were amazing. The home was very comfortable and we loved that we were able to bring our dogs with us. The deck and location are amazing! Very good Internet and cable setup. Nice selection of vacation reading materials in the library. The location was perfect. Right on the beach and walking distance to nice restaurants and shopping. Loved the large wrap around deck with dog gates on the stairs. Our dogs stayed with us on the deck with no worries. The large flat screen TV was a nice feature. Wireless internet was blazing fast. A/C and appliances worked very well. Beach walks with our dogs were excellent. It was nice falling asleep to only the surf sound and then waking up to see the sunrise every morning.